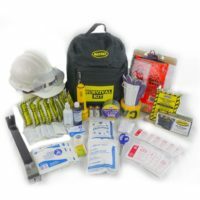 Our Complete Emergency Toilet and Sanitation Kits include all the essential Hygiene and Sanitation Supplies you’ll need for Disaster Preparedness, Classroom Lockdown, Severe Storm Survival, Camping, Emergency Planning. These emergency buckets make great emergency sanitation kits as a School Safety Go-Bucket or Earthquake Survival Kit! 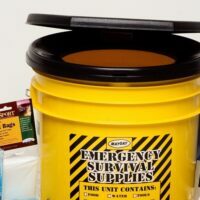 Go-Bucket Toilet Kits are bright yellow for easy visibility to grab for use in a disaster survival or school lockdown situation. Emergency toilet seat with lid snaps on top of honey bucket (portapotty) for easy use, easy removal. 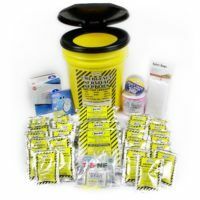 Complete toilet and sanitation kits contain hygiene and emergency sanitation supplies you need for travel, camping, emergency preparedness, family earthquake kit, or classroom disaster lock down. 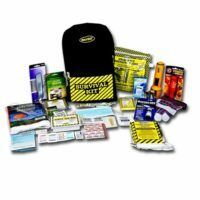 Sunset Survival’s Emergency Toilet Kits make great School Kits for classroom earthquake survival or disaster preparedness planning!